Over the last month or so, I’ve been very busy playing with my latest toy, the Cricut Explore. I’ve already revamped my front doorway, and given it some fabulous contemporary door numbers and we’ve made lots and lots of gift cards, envelopes and book marks. The girls have had a wonderful time this summer holiday, designing and crafting. My eldest has even designed her own logo. The Cricut Explore is much more than a crafting machine though. At first I was nervous and skeptical of it, thinking that, as I’m not a big crafter, this maching wouldn’t hold much interest for me. How wrong could I have been! I can’t leave the darn thing alone, and have a huge list of home projects that I’m working my way through one by one. As you may know, I love my wall art. I have a huge Wall Art Pinterest board if you would like to check out the kind of things I love looking at and taking inspiration from. So, it was with this in mind, that I decided to create some wall art of my own using the Cricut Explore. 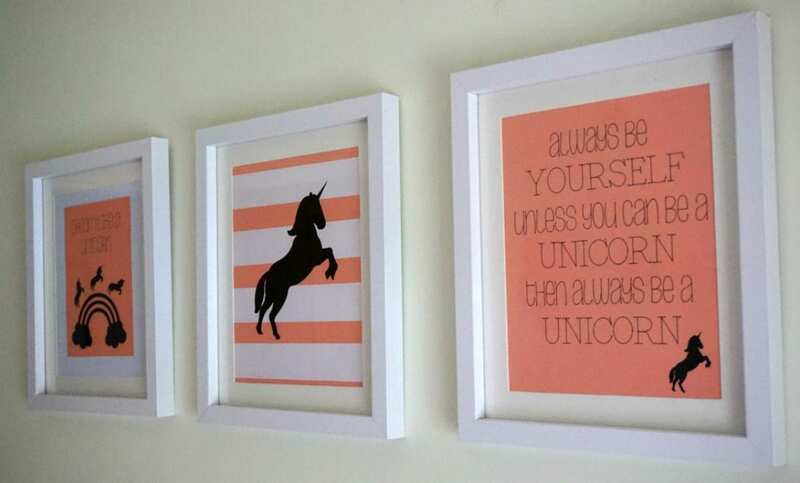 Follow Jen Stanbrook www.lovechicliving.co.uk’s board Love Wall Art on Pinterest. 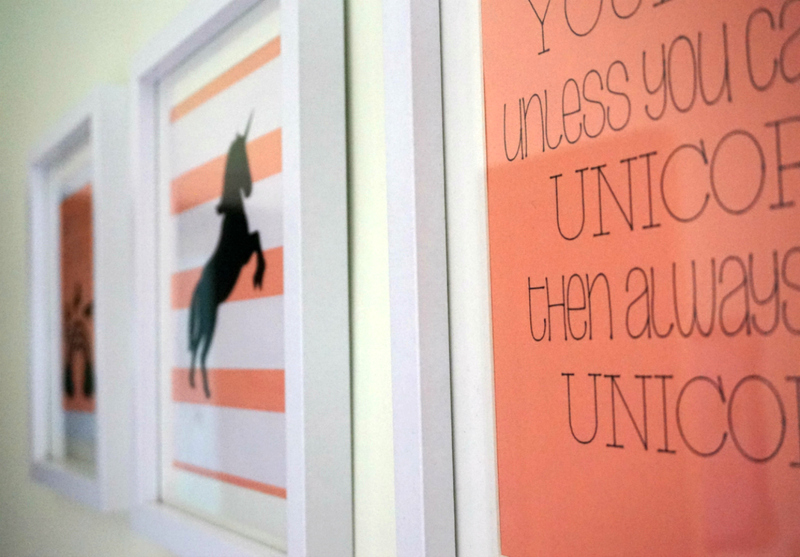 Miss R, my youngest daughter was keen for some new pictures for her bedroom so we chatted about the kinds of prints she would like, and pretty immediately she came up with a Unicorn theme. After an evening on Design Space, the Cricut Explore design software, I came up with a few different designs and got to work printing them out. Print #1: I found this quote on Pinterest and played about with the fonts to get something contemporary, before adding in a Unicorn image from the Cricut database. The black frame is a just there as a guide to see how the whole thing will look once it’s the real frame. I’ve learned to remember to ‘attach’ the text to the rectangle to ensure the software knows where to write it, once you hit ‘go’. Print #2: I wanted the prints to complement one another so continued on the black unicorn theme, this time on a striped background. The pink is Cricut cardstock, but you could use any card at all, then the white strips and unicorn itself are made from vinyl. Again you could use card, it would just make a thicker finish. Print #3: I took inspiration from the children for the final print, incorporating their ideas for a rainbow, and leaping unicorns! Adding a little more text gave it the typography feel too. 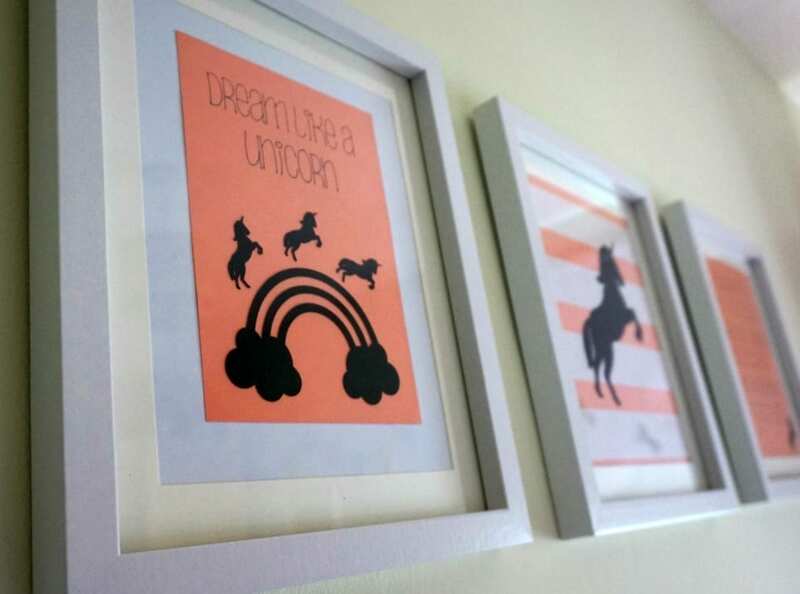 The rainbow image is from the Cricut database again, and as we were running out of vinyl, this one is using card. It’s so simple to do. Hitting ‘Go’ will bring the Explore to life, and you just follow the instructions, loading each pieces of card onto the mat as requested, not forgetting to insert the correct pen. Then it’s just a case of glueing it all together. The frames are 8×10’s and cost just £3.20 each from The Range, and in no time at all, I’ve created some personal, fun, unique wall art for a girl’s bedroom. What do you think? 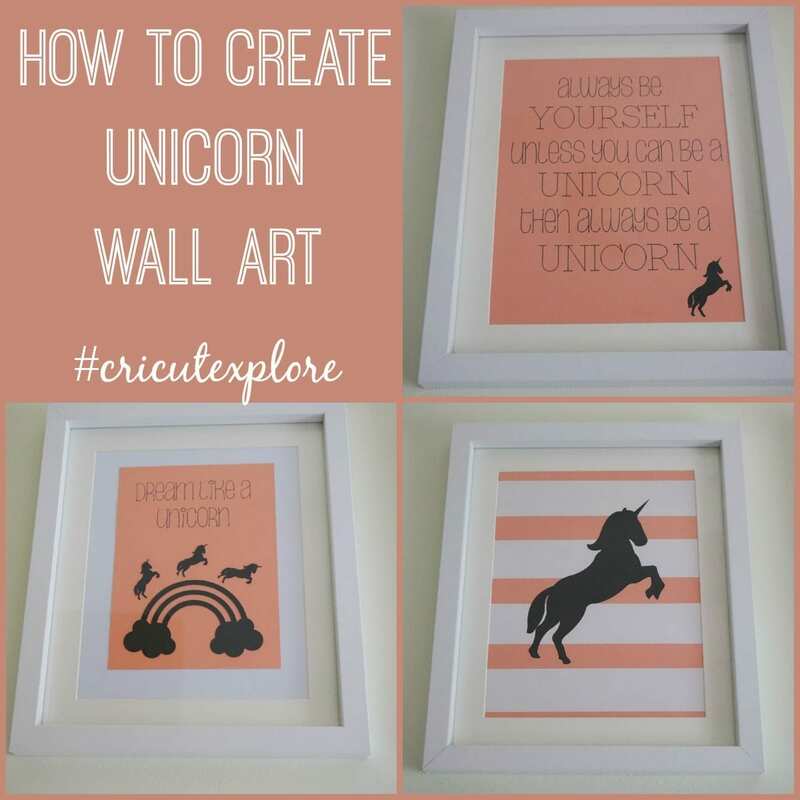 To be honest, there are no limitations with the Cricut Explore, just your imagination! You can create anything you like, even uploading your own images to make something incredibly personal to you. I have a full Cricut Explore review post coming on the blog shortly so look out for that if you’d like to know more about this amazing machine. In the meantime, check out the Cricut website for more information. Oh they look great, and I love the colour of them too. Now I see what you mean about ‘attaching’ I’ll try that, and see if thats the mistake I’ve been making. I think we bought the same frames, aren’t they good value! I think we do have the same frames, yes. Great minds … and all that 😉 Good luck with the attaching. These are really cool. I love the colours you have used.